in the garden of life,"
inviting your companions to join you in your yard. The forest green of the plaque blends with the surrounding flora, while gold highlighting accentuates the letters and curved detailing of the item. The green background is mottled with gold flecks, allowing the sign to shine in sunlight. The recycled cast aluminum construction will withstand harsh temperatures for years to come. Place the plaque on the included 17" tall mounting stake and place the unit in the ground. 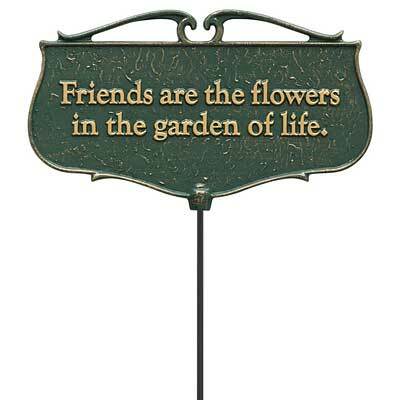 Make a joyful retreat in your lawn with this Garden Poems Plaque.